Are you searching for investing information, education, or advice to secure and grow your retirement nest egg? Until now, the 401(k) or small individual investor had to go it alone, being ignored by investing professionals as too small and unprofitable. As a consequence, many investors found unreliable sources of information and advice, depended on the 'wisdom of the crowd,' or their 'gut' instincts. By focusing exclusively on the neglected 401(k) investor population in need of quality advice, we have developed a unique, valuable, affordable program that not only produces the results you need, but does so in the ultimately secure fashion — it's self-directed. Visible Investment Advisors have years of experience helping employees optimize the value in their 401(k), 403(b), 457, and other deferred retirement plans, and we can help you achieve retirement security — regardless of the size of your portfolio. Take a minute to answer the questions below, then see how you compare with the results of our Investor Survey. Do you have all the information you need, and the time and know-how to analyze it? Where did you get your investment education? Do you require the help of an investment professional? 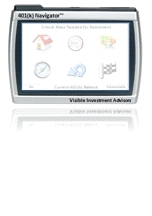 Visible Investment Advisors have developed the 401(k) Navigator™ Program — like a GPS for your 401(k) — it's simple and easy enough for everyone to understand and follow. A Registered Investment Advisor using the 401(k) Navigator Program matches your investment goals, time horizon, and risk tolerance with funds in your plan, suggesting reallocation of your current funds, and redirection of your future contributions as needed. Using the 401(k) Navigator Program, your Advisor plots your shortest, lowest cost route to your financial retirement goal. When you encounter adversity (when the market goes down, or if you have a life changing event), your Advisor using the 401(k) Navigator Program will recalculate your new optimal route and get you back on track to your retirement goal. While investment results can never be promised, 401(k) Navigator investors sleep well at night, knowing that their money is working as hard for them, as they did for it. You can lower your expenses (0.65% on average) — lowering your investment expenses means more money is left for you to invest and compound. In most cases, the 401(k) Navigator program saves more in mutual fund expenses then the program costs. You can increase your returns (1-3% on average) — we'll help you select the mutual funds that eliminate under-performance, and keep you in them so you don't buy and sell too often, or at the wrong time. You can decrease risk and volatility (priceless) — you'll own diversified stock and bond funds, keeping an equity bias, and maintaining plenty of cash on hand just waiting to take advantage of market fluctuations. Visible Investors look forward to, and benefit from, market volatility (which happens more often then investors expect). The Visible Investing 401(k) Navigator™ Program, administered by your own personal Registered Investment Advisor and directed by you, has a flat fee — no matter the size of your portfolio. * Offer expires November 15, 2009, when the price returns to $349. You'll typically save more from reduced expenses then the cost of the program (we can let you know before you begin if this is likely to be the case in your situation). The increased returns and decreased risk — they are all yours! Your retirement lifestyle depends on making good choices – make your first choice the Visible Investing 401(k) Navigator™ Program! Tel: (949) 209-9113 Copyright © 2005-2009, All rights reserved.